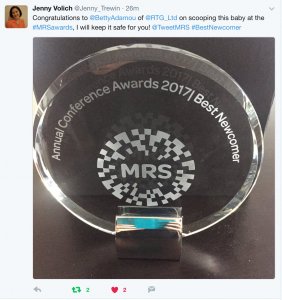 Following my presentation at the IMPACT 2017 conference, I was nominated for Best Newcomer award, and among the nominees were other great speakers from the event. I’ll be writing about what I presented as a case-study, as well as the revolutionary move that the fashion industry is experiencing right now in moving towards using data as part of the design toolkit and slow fashion, in IMPACT magazine later this year. I’ll also be sharing this information at the MRS Best of Impact event in Salford, Manchester in September. The criteria for the award was that you would have never spoken at an IMPACT conference in the past, and in spite of speaking at almost all market research conferences to date, it was indeed my first time speaking at IMPACT! 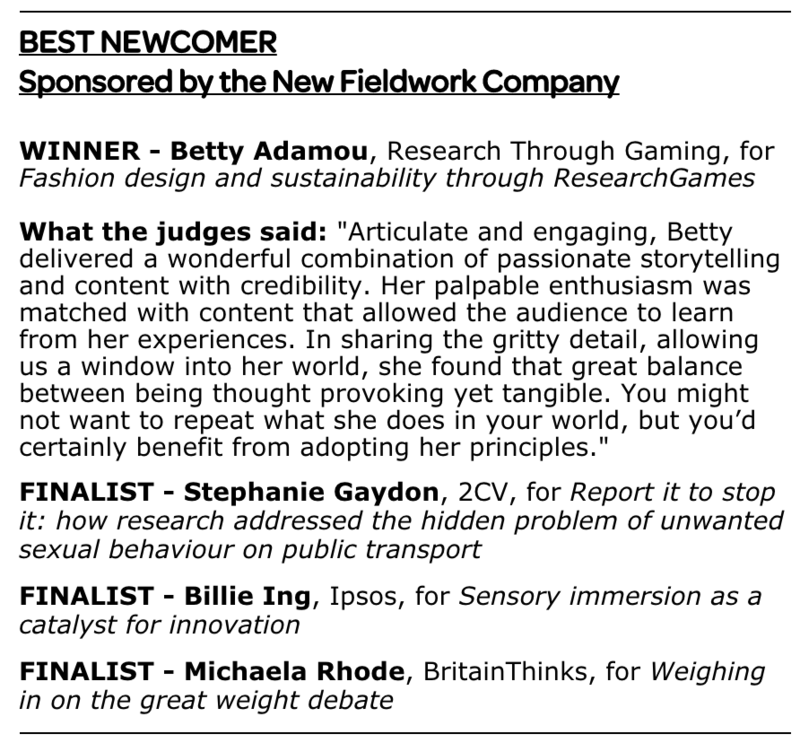 I would like to thank Danielle Todd from Relish Research for her social media shout-outs and support for this award, and of course the judges who nominated the presentation, and of course the Market Research Society team for putting on a great conference and (so I heard through the grapevine) awards dinner in London, which sadly I couldn’t make. I loved putting together this talk for IMPACT 2017. 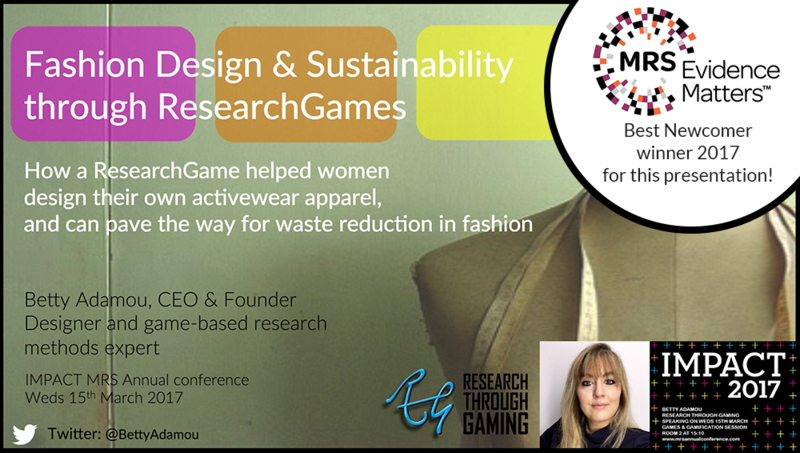 I often give talks about game-based research, but this particularly talk was exciting for me as I got to share something really different about what the RTG have been up to and especially as it is a subject with a social conscious; sustainability in apparel development. The presentation was about how my team and I developed a ResearchGame looking at what women wanted from their activewear bottoms on behalf of Fortune 500 company, the VF Corporation for their Lucy Activewear brand, based in the US. The VF Corporation also own a host of other brands including The North Face, Vans and Timberland. By using our ResearchGame to understand more about what people DO want from their clothing, it helps brands to make less of what people DON’T want, and it is my belied that we can use research to help reduce waste in high street apparel development and aid sustainability now, and in the future. 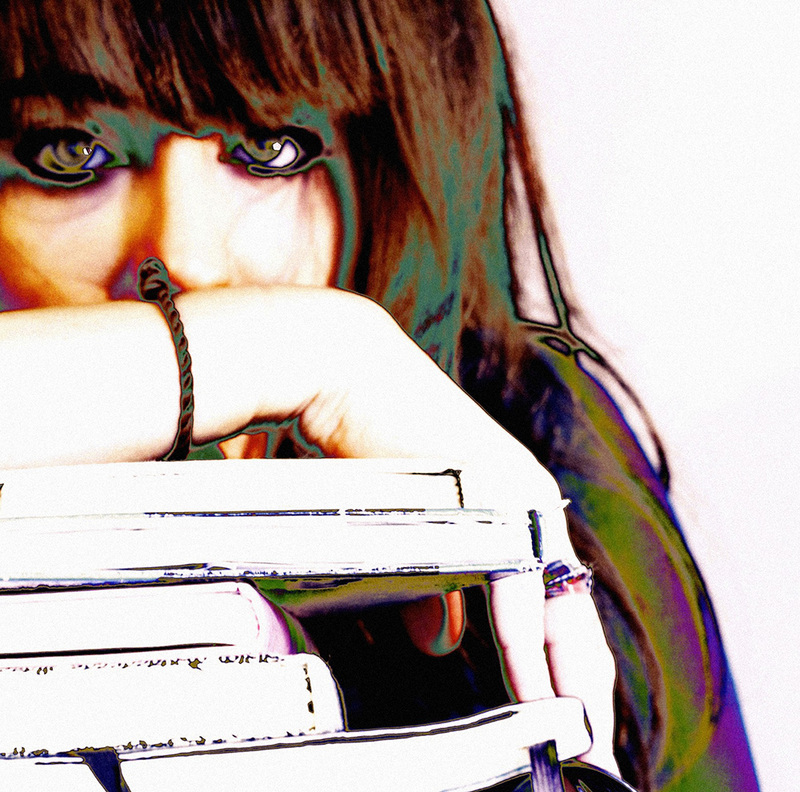 For apparel designers, the ResearchGame acts as a decision-support tool and helps them use data-as-evidence to spot consumer desires. RTG will be using this ResearchGame in similar endeavours in the future and more news is on the way. A very big thank you to Ray Poynter and Andrew Jeavons , they are my mentors and business advisors who are always sharing their wisdom with me, While the project with the apparel development ResearchGame was underway in early 2016, my dad passed away. Ray and Andrew were instrumental in the whole process while I was trying to do an interesting combination of work/grieve. They are absolute stars! And of course an equally big thank you to my husband and colleague (we often work together on various projects!) Paul McGhie, who was instrumental in helping me to create the presentation that got the award in the first place – he helped me shape the presentation from what was a generic case-study into a compelling story, and with plenty of tea, which always helps. Thank you so much to Jenny Volich at Kogan Page who very kindly collected the award on my behalf, as I wasn’t able to attend. She also sent a lovely tweet out to the masses, captured here. Last, but by no means least, a huge thank you to the entire Lucy team at the VF Corporation, and especially to Vanessa Dillof who was happy for me to share her quotes and highlights pertaining to our study. Without this project there would not have been a conference talk to deliver! I thank the entire team for their engagement and collaboration during the project and after in allowing me to share our work.